Hello, Weekend Warriors! Time for our third and last installment on Henry VIII. Now that we’ve gotten all those distracting wives out of the way, I want to give a brief nod to this king’s other pursuits. 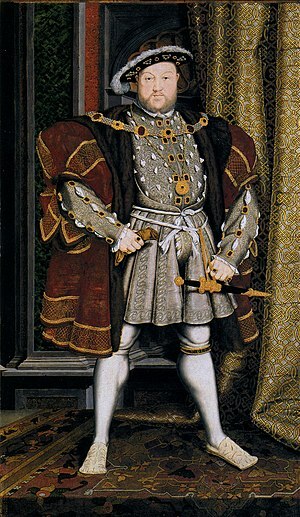 To start, the younger Henry VIII is actually an attractive man with much charisma. He is highly intelligent and writes books and composes music; before he grows obese in his later years, he is also athletic and fond of hunting, jousting, and tennis. Politically, I’ve previously discussed how he leads a successful campaign against the Scots in 1513 and an unsuccessful one against the French that nonetheless results in peace with them in 1520. We’ve also seen how he creates the Church of England so that he can finally divorce his first wife who couldn’t provide him a male heir, though his religious ideals still remain essentially Catholic—modifications to worship are slight, as opposed to a total theological overhaul. Nonetheless, his action is pivotal to England becoming a Protestant nation. Around this same time in the 1530s, Henry VIII is also responsible for uniting Wales and England. Henry is a fairly extravagant spender, his two+ week meeting with the King of France in 1520 at the “Field of Cloth of Gold” costing a pretty penny, for one (this is an extravagant occasion of feasts, entertainment, and gift-giving, with tents and costumes made from cloth of gold, which is woven with silk and gold thread). He expands the naval fleet from 5 to 53 ships during his reign. And much money from the dissolution of England’s monasteries goes toward wars and strengthening aristocracy, leaving apparently not enough left over for when he goes after France again in the 1540s and requires forced loans and depreciated currency to finance it, increasing the country’s inflation. All in all, Henry VIII‘s reign increases government bureaucracy and secures more absolute power for the monarchy. It is also characterized by his preoccupation with succession; having a male successor has been so critical because the Tudor dynasty is still fairly new (Henry VIII is only the second monarch to reign under it), and it’s thought that a queen might not sustain her power, especially if married to a foreign power who could then dominate rule. For all his fuss over obtaining a male heir, however, when Henry dies in 1547, all he leaves behind is one sickly son, Edward, and two daughters, Mary and Elizabeth.